Eggs are healthy: Eggs are nature’s perfect food, providing excellent protein, as well as the gamut of nutrients and important fatty acids that contribute to the health of the brain and nervous system. Americans had less heart disease when they ate more eggs. Egg substitutes cause rapid death in test animals. Chris Masterjohn, PhD, teaches us about the Incredibly, Edible Egg. Butter is good for you: Butter contains many nutrients vital to growth and brain function. Butter has nourished healthy populations throughout the globe for thousands of years. Read more about why Butter is Better from the Weston A. Price Foundation. Saturated fats and cholesterol are vital for optimum health: Cholesterol helps babies and children develop a healthy brain and nervous system. Saturated fats provide integrity to the cell wall, promote the body’s use of essential fatty acids, enhance the immune system, protect the liver and contribute to strong bones. Saturated fats do not clog arteries, nor do they cause heart disease. In fact, saturated fats are the preferred food for the heart. Learn more in an article titled The Skinny on Fats. Foods from grass-fed animals are important for good health: Red meat is a rich source of nutrients that protect the heart and nervous system, including vitamins B12 and B6, zinc, phosphorus, carnitine and Coenzyme Q10. The fats of grass-fed meats contain vitamins A, D, E and CLA, a substance that prevents obesity and protects against cancer. Read more in an article tilted Splendor in the Grass. Lean meat and low-fat milk should be avoided: Lean meat and low-fat milk will cause depletion of essential vitamins A and D, needed for protein and mineral assimilation, proper growth, thyroid function, healthy brain and nervous system and normal cell function. Learn more about low fat diets and about how to take the fear out of eating fat from the Weston A. Price Foundation. Read about our recommendations for milk. Modern soy products are dangerous: Modern soy foods, such as soy protein powders and soymilk, block mineral absorption, inhibit protein digestion, cause endocrine disruption, depress thyroid function and contain potent carcinogens. Read about the Ploy of Soy. We recommend The Whole Soy Story by Kaayla T. Daniel, PhD via our Amazon affiliation. Hydrogenated and liquid vegetable oils contribute to heart disease and many other health problems: During the period of rapid increase in heart disease (1920-1960), American consumption of animal fats declined, but consumption of hydrogenated and industrially processed vegetable fats increased dramatically. Processed vegetable oils have also been linked to cancer, bone problems, growth problems, learning disorders, autoimmune dysfunction and infertility. Read about The Oiling of America in an article by Sally Fallon Morell and Mary Enig, PhD. We also recommend the DVD Sally recorded. A vegan diet leads to serious nutritional deficiencies: Vital nutrients found exclusively in animal foods include complete protein, cholesterol and vitamins A, D, B6 and B12. We can’t get sufficient true vitamin A from plant foods, nor can most of us get enough vitamin D from the sun alone. Vitamin B12 is not absorbed from plant sources, and modern soy products actually increase the body’s need for B12. Those who do not eat meat can have a healthy diet by consuming eggs and raw dairy foods from animals on pasture, and by avoiding modern soy foods. Take a Vegetarian Tour from the Weston A. Price Foundation. We recommend The Vegetarian Myth by Lierre Keith. Not all “organic” foods are healthy: Organic pasteurized milk, breakfast cereal, chips, cookies, crackers and fruit juice are highly processed, refined convenience foods lacking vital nutrients. Although the organic label for meat and milk ensures the absence of hormones, antibiotics and pesticides, such products may still come from animals in confinement and therefore lack vital nutrients for growth and immune function. Breakfast cereal is a junk food: Cold breakfast cereals, even organic ones, are produced by a process called extrusion, which causes the deformation, disruption and dispersion of the proteins in grain. Studies indicate that these chaotic protein fragments are toxins, causing havoc in the gastro-intestinal tract and nervous system of test animals. Read more about the concerns we have about breakfast cereals. We also recommend Fighting the Food Giants by Paul Stitt. 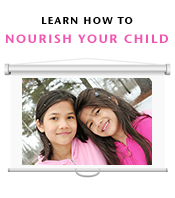 Learn more in our Nourishing Our Children’s educational materials! What would you recommend for another 10 to list? Sandrine, thanks for the list of truth about food. I find that clarity and reinforcement of the things I am learning about food are very helpful. How about a 10 list of quick and easy truly nutritious meals, to make without a recipe or prep when there’s little time? For example, things we enjoy are: bacon and eggs, grilled cheese, salad with leftover meats and cheeses, ground beef sauteed with added tomato sauce and cheese, cheeseburgers, yogurt with maple syrup and granola, cheese omelette, a milkshake blended with fruit and cream, a bowl of Sarah Pope’s (The Healthy Home Economist) grain-free Nutola with milk, leftover chicken in a quick cheese sauce. Of course use the best ingredients you can and when you do have time to cook a big roast chicken or meat, cook lots. I know it’s not a list of facts, but it’s 10 meals that are almost as quick to make as processed box food, and probably about 10 times more nutritious. 6 out of 10 on this list have cheese? Isn’t cheese processed? Where’s the dark green leafy vegetables? And beans/rice? Don’t confuse processed with refined. Even vinegar or bread are processed (fermentation). Cooked meat or potatoes are processed as well (the process in this case is called cooking). Elizabeth, do realize how much sugar is in yogurt ..then you maple syrup to it? And what kind of cheese are you using, is it organic, low fat, non-processed? Yogurt, granola, maple syrup….do you realize this is a low carb/ketogenic article? You ought to doo some reading before commenting info that will confuse someone still learning. This is not a low carb/ketogenic article. Traditional diets had a wide range of carbohydrates included in their diets. Your eating allot of Sodium also..Sodium is going to be the next big topic of un-heathy foods that is causing major Heart decease. Sodium is called the silent killer for a good reason. You do not know you have it, and it does cause, Stroke and heart decease..
Now it’s proven Organic pastured soy free eggs are healthy, but its what you eat with it that is NOT. Is you bacon at least Nitrate free?and less salt? Is your cheese your feeding to your family, Organic, or fake cheese that is Omega 6? The Pasteurized diary you buy in the market is junk food..
Annie; Actually it is high blood pressure that is called the silent killer and it has been proven that of those with high blood pressure, only a small percentage is sensitive to salt. You need to do some more research. Pink himilyan salt is extremely good for you! Not plain old table salt though. It is high blood pressure that cause heart attach and stroke – not salt. Love this list! Sandrine Love I wonder what your thoughts are on fermented soy like Soy Sauce, is it ok is moderation? Surely the traditional Japanese way of dealing with the bean eliminates the toxins? It is important to distinguish between traditional and modern soy foods. In Asia, traditional soy foods were consumed in small amounts, usually as a fermented condiment. The soybean contains many naturally occurring toxins. All legumes contain toxins but the problem with soy is that the toxins are found in very high levels and are resistant to the traditional ways of getting rid of them. One of the most common myths is that soy estrogens (isoflavones) are beneficial for your health. Isoflavones are the estrogen-like compounds occurring naturally in soy foods. They act as the plant’s natural pesticides, causing insects to become sterile. Thanks for the explanation as I’m always perplexed about the fact that the Japanese are of the healthiest people on the planet and their consumption of soy .i continue to enjoy it in moderation and only buy the Japanese organic brands of soy sauce and miso and avoid everything else soy. The health of the Japanese comes, I suspect, mostly from their true sense of moderation in all things. They have worked hard to establish healthful customs to live sustainably together in their small space. It’s not their consumption of soy that they can attribute their good health and longevity to–perhaps fish and fermented natto, but not tofu! Light meals and soup (bone broth!) are also a cultural aspect that is overlooked. It’s like saying they’re healthy because they eat white rice. It certainly isn’t the white rice either (and they even eat that in moderation–not in the heaping piles we Americans think is appropriate to dish out in restaurants!). Daily movement is a huge part of Japanese culture–imagine if every American child were taught to do daily regular movements to sustain their health–that would go a long way. Do you have recollections of your childhood PE classes? I clearly recall hiding with the other non-athletic girls and one boy while the others ran around playing games such as dodgeball, kickball and whatnot. Baseball? That was a laugh of a game for people worried about getting whacked in the head with a ball. The thing about daily movement is that ALL people can do it and should do it. It’s non-competitive and all-inclusive. Check out the Japanese daily movement exercises–they’re very fun! Chocolate kills dogs and therefor its toxic to humans. (I’m using the same ”logical” as you here). Excellent article! I’ve been eating like this since July and have no more migraine headaches! Thanks for a great article. Was wondering if you would be able to have an option to save as a pdf file, for those of us who would like to print it. Also, a list of references at the bottom would be great, especially those that come from peer-reviewed studies. I find these very helpful if I am going to share something with friends who have a scientific background. Follow each link for further reading and you’ll find the references there. There are simply too many for us to cite here in a brief summary list. We don’t have a pdf version of this article at present but, I will consider your request! Chef Barry there are some of us who are “raising food fit to eat”® as small farmers. We have pastured beef, pork and poultry. Don’t give up! Your research on veganism is lacking. Spreading misinformation is a terrible offense. If you want to generate a discussion, you should offer a counterpoint instead of a complaint. Citing supporting research wouldn’t hurt. Here you go: http://qjmed.oxfordjournals.org/content/92/9/531 This is one of many. I know robust vegans. While I agree that, if you choose to eat meat, grass fed, free range is best, I don’t subscribe that eating meat, or eating animal products at all, is the only way to be/stay healthy. Mushrooms are a great source of vitamin D, for example. The amounts of B12 you need are also pretty small and you can get plenty from either small amounts of meat or supplements. I eat meat less than 2 or 3 times a month. I’ve been doing it for a while and I feel great. A diet heavy in meat is a lot more likely to lead to deficiencies. Vegetables in general are high in nutrients and low in calories. Whoever wrote this article sounds like he doesn’t know what he’s talking about. you’re obviously not a vegan if you do eat meat or animal products at all.. we’re also not meant to be herbivores.. This article has good points, but most are misleading. People who eat animals will always fine ways to justify there blood lust. Find, not fine. Their, not there. This is great, however, fermented foods are so important, I think they deserve a Top Ten assignment. I concur 100% … fermented dairy, veggies, fruits, et cetera … and beer! Dr. Artemy Alexis Horvath (1886-1979) studied soybeans and soyfoods. Although my interest is merely academic, my short advice would be to stay clear of soybeans unless they are cultivated using organic or natural methods. Most crops in North America are comprised of GM varieties. These soybeans are processed for industrial* uses only. Personally, I grow my own soybeans using a natural farming method. After experimenting with various soyfoods I have concluded that fermented soy natto may be the safest known soy based food product. It’s taste may not be to everyone’s liking though. It’s healthful properties make up for it. Feel good about your food! * One would hope that this is the case as GM soy is toxic. ANY diet can lead to serious nutritional definiciences. key word here being “can”. a healthy vegan diet WILL NOT lead to nutritional deficiencies. Vegan diets do not necessarily lead to serious nutritional deficiencies. Vegans who properly plan their diets out can get the right amount of nutrients. The fact that this article says this makes me unsure about whether the rest of it is good information or not. Because of your lack of research on a plant based diet, I can’t take anything else you say on here seriously. There is very little (if any) research published in respected journals that shows a significant health benefit from consuming organic labelled foods instead of conventional foods. You are seriously misinformed. Who stands to gain from spouting 60 year old research? Grain, big pharma, metal and agricultural industries are getting rich because we’re afraid of fat. The SAD has made the US the sickest and fattest nation in the world. Diabetes, PCOS, autoimmune diseases, cancers have skyrocketed since we started eating whole grain, carb filled, low fat diets. Cholesterol has been proven time and time again to have ZERO affect on heart disease. Inflammation is the root cause of cardiac and all other diseases. Cholesterol is vital to your brain and every single cell and hormone in your body. Saturated fats increase HDL and converts particle B LDL to non harmful particle A LDL. Carbs increase triglycerides, LDL-B, and VLDL. Read current credible research, not old, unproven, debunked opinions. Woo hoo! great response, Kim. For those who is still worried about cholesterol. I would highly recommend video presentation The oiling of America. That’s inaccurate. The requirement for sunshine can be fulfilled by having a couple small windows to let in minute amounts of sunshine. Lots of dubious and misleading information on here. Vegan diets are among the most healthful diets and it’s not that b-12 isn’t absorbed from plant sources, it’s that is not there. It would have been possible before modern industrialized farming and water treatment to get b-12 from eating vegetables directly from b-12 rich soil or from the water supply, but these days it’s as simply as taking a b-12 supplement. It’s the ONLY supplement I take and my bloodwork is stellar. It’s also important to check who is supporting a study (for example, the dairy industry likes to sponsor studies that will inevitably show dairy is healthful) and there is SO MUCH research done with respect to soy anyone could cherry pick a study to support their own agenda. Many of those studies are animal based (even those that show a correlation between soy and improved health) so it’s wise to look at human population studies, especially those studying Asian populations who have been eating soy for ages (I’m not referring to highly processed soy, btw). and dairy in all its iterations is just not good for you OR the planet. sure there are some healthful nutrients, but the negative aspects (hormones, growth factors, allergens etc etc) far outweigh any of the positive effects. We feel very confident that the information we’ve provided is neither misleading or dubious. We care deeply about the health and well being of the larger community, which is why we don’t recommend a sticky plant based diet http://www.westonaprice.org/health-topics/abcs-of-nutrition/vegetarianism-and-nutrient-deficiencies/ nor soy http://www.westonaprice.org/soy-alert/. I’d also like to point out that getting adequate vitamin D is not a problem unique to vegans … It’s a problem for anyone who lives in cold climates, which is why there are foods fortified with vitamin D.
Sure our perspective? Death ears? No need to say anything more. I was referring to deaf ears, not death ears. Thanks for highlighting the typo! 11. Nuts are to be eaten raw. They should not be roasted and flours obtained from nuts are not suitable for baking. I’m totally on board with all of this and have heard it before except that lean meats are bad. When I think of lean meat, I think of an elk steak that has very little fat on it and is grass fed but I would assume that’s healthy! So what kind of lean meat are you talking about here? <– no snarkiness, I really do want to know! “The aboriginal diet was most interesting. It had a lot of variety, including fruits, vegetables, grains and legumes. The grains and legumes were prepared with great care. They were placed in leaching baskets in a running stream for two weeks and then prepared by roasting, pounding and cooking. We see this careful preparation of grains and legumes in all traditional societies that ate these kinds of foods. We would not recommend a skinless, boneless chicken breast. Rather, we recommend you be sure to have the skin with it or add mayonnaise to make chicken salad … or add avocado. If the meat is lean, prepare it with added fat. Liver is not a filter and does not store toxins. Organ meat is more nutritious than muscle meat. I would love to know more about nut butters and seed butters (almond butter, tahini, etc). Are store-bought nut butters good, bad, or a compromise (raw/organic or otherwise)? Are the anti-nutrients/enzyme inhibitors neutralized at all after nuts become butter, or is eating non-pre-soaked nut butter equivalent to eating non-pre-soaked nuts? Are American almonds (which must be pasteurized by law) still somewhat healthy, or are they a food to be avoided like pasteurized milk? And should I avoid store-bought Almond Butter for this reason? And so on. The entire subject of Nut Butters is full of questions. I think I found my new favourite blog. Totally agree on the all 10 facts. Wonderful! Thank you for your support!